This past weekend, we took a long hike around the coastal redwood forests in Sonoma County. We didn't plan on going, but Romy wanted to buy a gas tank for welding gas so that he could weld in the garage. He found a cheap tank (which still had some gas in it) on craigslist, but it was far away in Sebastopol, in Sonoma County. We figured that the guy was selling it for so cheap, that even paying for the gas (and time) to get there, it was still worth it. We priced it out after visiting the welding shops in Oakland and Berkeley. Romy hiking towards the summit of the hiking trail we were on in Armstrong Redwoods. Sebastopol is a small town in the coastal redwood forest/ farm land. As we drove up north, we saw a lot of cow pastures, and other grazing lands. Since we weren't scheduled to come pick up the welding gas tank until after 3:00pm on Saturday, we decided to go out early and hike around Armstrong Redwoods State Natural Reserve until it was time. 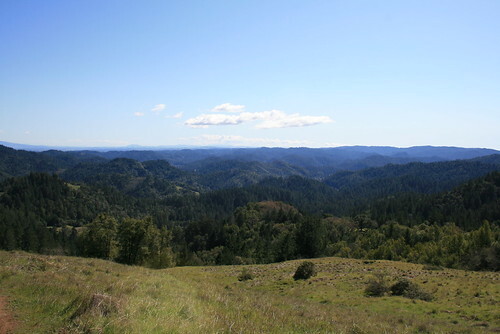 The reserve was just north of Sebastopol, and along a beautiful scenic drive. 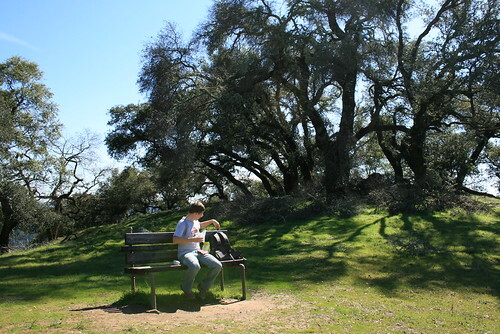 Taking a lunch break after a steady hike uphill. Armstrong Redwoods was set aside by a logger in the 1800s named Armstrong (surprise!) who decided to preserve some of the ancient redwood groves he was logging in the area. It was later expanded into the Austin Creek Recreational Area, and now its a huge park with a campground that is open year round, and also has 3 backcountry campgrounds which can only be hiked into. 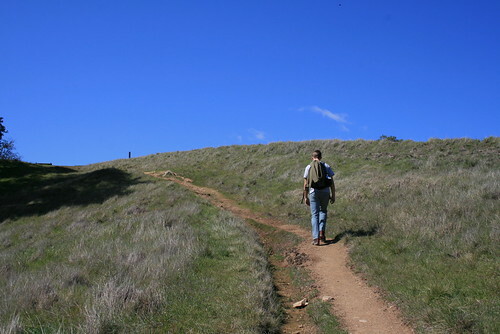 There are miles and miles of trails to hike, which we decided to get on. We had about four hours, so when we got there, we bought a map for $0.54, and picked a loop trail which was about 6 miles round trip. The view from the summit of the trail. You can see the surrounding coastal range. It was a beautiful sunny clear day, and pretty warm. We hiked in pants and a t-shirt most of the way. A little more than half way through, we stopped for lunch on a bench which was placed on the summit of the trail we were on. We had views of all of the small mountains around us in almost all directions. Most of the pictures we took were on or near this summit, because deep in the redwood forest, it was really dark and not so great for taking pictures. 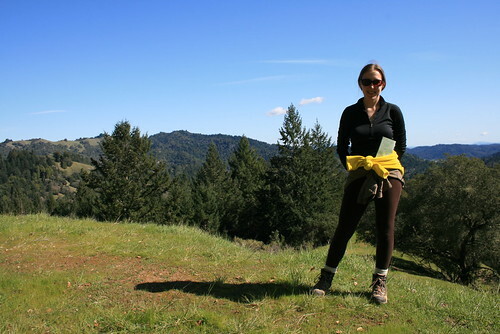 Jenn hiking in Armstrong Redwoods. Both of us pausing for a picture. The redwoods in California exist only in a thin band along the coast, and mostly in central and northern California. This is because the enormous trees need a lot of water. In the winter, during the rainy season, the redwoods get enough water due to precipitation. In the summer, when there is little or no rain fall, the redwoods still get enough water because of the fog from the ocean which brings moisture to the trees. This is why they can only exist in a narrow band along the coast in the mountains. Without the fog, the redwoods could not really survive. Fog condenses on the trees and in general mists the environment giving enough moisture to the redwoods for survival. 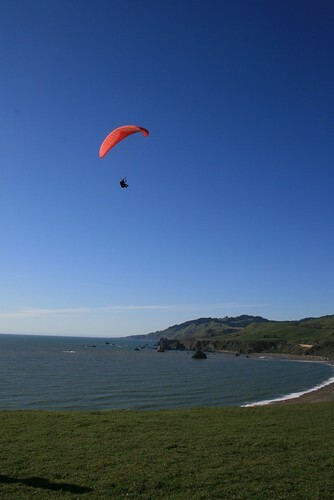 This picture was taken at Sonoma Coast State Park. What a beautiful sunny day on the coast! After we were done hiking, we called the guy with the welding gas tank, but there was no answer. We figured he was still out on a ride (he told us he was going to ride his motorcycle during the day) so we also went on a short ride (except we were in a Daewoo). We were so close to the coast, we decided to go to the beach. Armstrong Redwoods is right on the Russian River, which flows into the Pacific at Jenner, a small town on the cliffs where a lot of otters and seals live where the Russian River ends and flows into the ocean. We drove along the river until we got to Jenner. 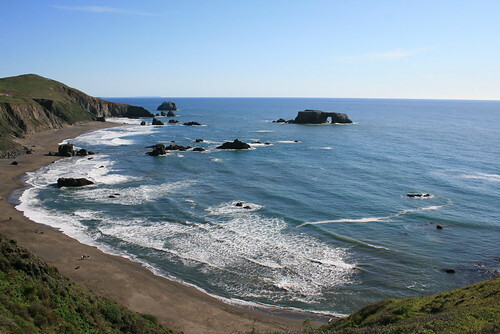 Then we headed south along the coast towards Bodega Bay. 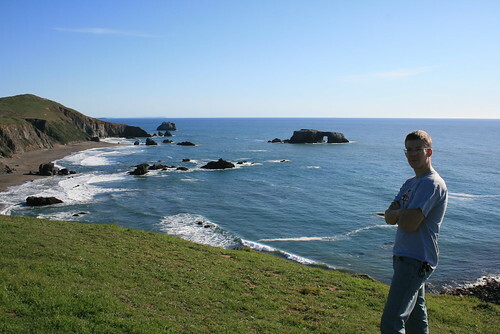 Along the way, we stopped to see the cliffs and rocky coast at Sonoma Coast State Park. 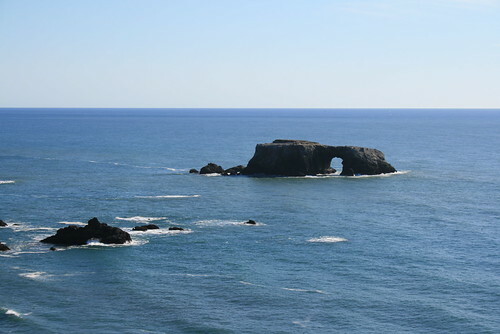 A close up of a big rock in the ocean with a natural arch. A little bit later, we got a call from the guy with the welding gas tank, so from Bodega Bay we went inland towards Sebastopol. 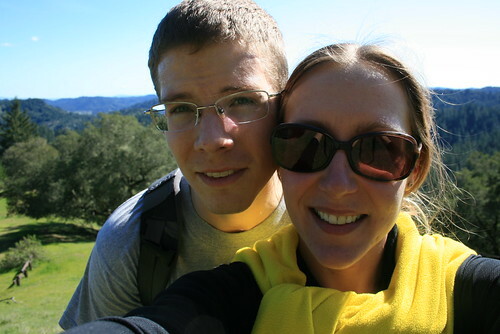 It was a short but scenic drive, and we finally made it to his "mansion." I say mansion because he had a huge house on a couple acres of land, and a welding/garage shop that was almost as big as his house. Not to mention that to enter onto his property, we needed to buzz him at an iron gate which he remotely opened for us and then drive up a winding driveway! Romy and the Sonoma Coast. Then we got to his welding shop, which he didn't operate anymore since he was retired (and that's why he was selling welding stuff). In addition to the tank, he sold us some sheet metal and muffler piping for scrap steel price ($0.50/lb) which was a great deal for us. After Romy perused his shop for about 45 minutes (!) we got going on our way back to San Fran. We saw this paraglider take off from the ground. He stood at the edge of the cliff and ruffled his wing so that it would fill with air blowing off the ocean. Once it filled up with a lot of air, it swept him up, up, and away!